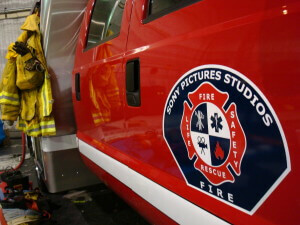 Sony Pictures Studios Fire Department needed their fire department patch design updated from a previous design. The result is a beautifully designed logo/patch that was created into decals for use on department vehicles, as well as for embroidery of new patches and screen printing on department uniform shirts. Below is a picture of the final fire department decal design once installed on one of the fire department fire engines.